In modern society, communication is king. Regardless of the culture you represent or the languages you speak, words have the power to convey the deepest emotions within our hearts. They express our thoughts, our feelings, our heaviest fears and our grandest desires. Words are everything. Unfortunately, words can also be a bit cumbersome; it takes a lot of them to form a coherent thought or to express a heartfelt emotion. In the age of fast-moving technology, people yearned for a faster, more concise way to show how they were feeling. Emoji are the little expressional characters that can be inserted into electronic communication platforms, such as email messages, text messages and social media posts. What is the purpose of emoji? Unlike a face-to-face (or phone-to-phone) conversation where two individuals can vibe off of each other based on the inflections in their voices, email – and eventually text messages and social media – did not have the same advantages. It became difficult to convey conversational context, like happiness, sadness, frustration, sarcasm, etc. Digital conversations needed a way to actively display these emotions without having to physically describe them. To fill this void in electronic communication, a young Japanese engineer, Shigetaku Kurita, designed 176 “picture characters” that he referred to as emoji. Since then, emoji have grown in quantity and popularity; currently, 92 percent of online users take advantage of 1,851 available emoji characters. Taking into account that all but a mere 8 percent of the online population employs emoji in their digital communications, this does not account for the specialized groups of people who utilize emoji on a daily basis. 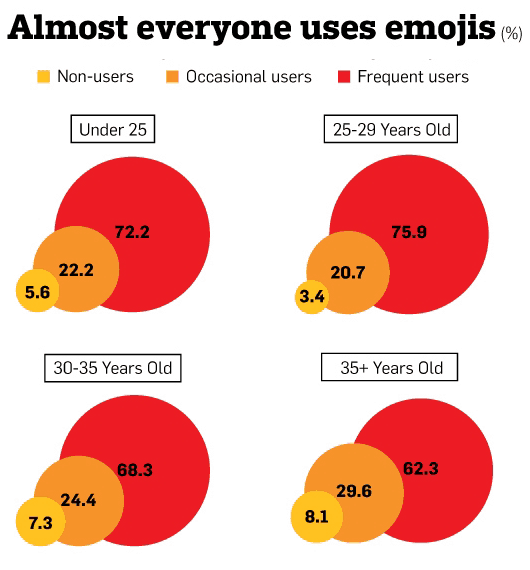 Without providing any data, it would be easy to believe that Millennials and Generation Z – the youngest, “tech savvy” generations – would be the largest proponents of emoji by a significant gap. This, however, is not the case. According to a recent study conducted by Adweek, the Silent Generation, Baby Boomers and Generation X frequently employ emoji in their online conversations, as well, with Millennials and Generation Z leading by only 4-10 percent. How should companies use emoji in their digital marketing campaigns? The last paragraph you just read is extremely important when devising an emoji-based marketing strategy. Every current living generation utilizes emoji enough in their daily lives to understand the importance and meaning of these pictorial elements. That means the most significant thing you should consider when creating an emoji-enforced marketing campaign isn’t necessarily your targeted age group; instead, you should hone in on the overall tone of the campaign you’re building. Emoji in digital marketing is not intended to be used in serious or authoritative campaigns. For instance, a lawyer discussing DUI defense probably wouldn’t want to include a glass of wine and a judge’s gavel in their marketing materials. On the flip-side, an ice cream parlor could use emoji depicting the sun, fire, snowflakes and ice cream cones to entice customers to cool off from a hot summer day with a cold, creamy dessert. When it comes to integrating emoji into your business’ digital marketing strategy, it is crucial to understand where these electronic characters can serve you best. Keeping in mind that emoji thrive in fun, less-serious environments, you might be able to guess that Facebook, Snapchat, Instagram, Twitter and Tumblr are great platforms to showcase your emoji prowess. You may also find success by inserting emoji into an applicable blog post or email marketing campaign. LinkedIn, white papers and case studies, on the other hand, should remain emoji-free due to their professional nature. What limitations do emoji have? When devising your emoji digital marketing strategy, keep in mind that these characters are not compatible with all digital platforms. Only web structures designed to accept Unicode, the official consortium for standardizing emoji, will be able to display characters accurately. The physical design of each emoji may also vary, depending on the platform you are using. Take, for instance, the visual differences between the same emoji utilized on iPhone, Android, Twitter and Facebook. When it comes to utilizing emoji in digital marketing, it’s important to follow your best conversational judgement; consider the flow of the text and determine if inputting an emoji would boost your message or harm it. Readers can easily sense when an emoji is tacked on or when a brand is posing as a “hipper” company than they may actually be. Next week, we’re diving even deeper into adopting an emoji-infused digital marketing strategy. Join us on the Seafoam Media blog to discuss how you can utilize these infectious characters to engage the next generation of consumers: Generation Z. Also, don’t forget to post your comments about this article to our Facebook and Twitter pages. We’re excited to read your thoughts!